This article is going to be ALL ABOUT GLUE! The best way to do it is imo is to show you how it works and try to tear it apart after they're done drying. It's going to be on the same material, with the same shape, which makes this 'experiment' much more accurate! I waited about 10 hours for the glues to dry before I start ripping them apart. I think most glue recommendation is about at least 12 hours or 24 hours...but I thought 10 could be enough. Hence results might vary if you wait a but longer (ain't nobody got time for that though 😆) I'll list out the pros and cons too in my opinion for the glues. 1. Sticking baked polymer clay to baked polymer clay. If you're gonna stick raw to raw/raw to baked clay, I recommend just using liquid clay! 2. Sticking any other materials to baked polymer clay. Like magnets, threads, earring backings etc. My tests is only for baked polymer clay on baked polymer clay, but I think it would work for situation 2 too, don't think it really matters, as polymer clay is still the main material. UHU glue is one of the most comment glue that people use for baked polymer clay. Most of the time....it's for projects that you're NOT going to sell/just a temporary fix. One of the PROS of UHU glue is that it's kinda gooey, and you can adjust the placement of the item even after you put it on so it's cool to make mistakes here! But because of this, it does take quite a bit to dry. When it's semi-dried, you can actually sue a tweezer to remove the excess glue, which makes the gluing process looks quite clean! Here's why I don't really recommend it. As you can see, it took me no effort at all to remove the two pieces, and the glue itself can be pried off easily from the clay! It doesn't really BOND with the clay and makes it very easy to be removed. Even the 2nd experiment failed miserably. Yes it did take me a little bit more effort but there wasn't much resistance at all haha. E6000 is actually one of the glues that was highly recommended for polymer clay, and honestly, I believed in it until one day @msparkpark told me it was really easy to remove it and I only realised that it really was basically UHU glue after I tried it out. It was quite disappointing. Here's how the texture is like! Maybe slightly more easier to control than UHU glue. Still adjustable etc after gluing, so same rules from UHU glue applies to E6000! You can still adjust if you need to after gluing. I do think it's a little bit better than UHU glue but mannnnnnn. I think it does bond with the clay itself a little, but really not enough to make it stick well. Same goes here. Trust me, these little pieces were really hard to bend without losing control of it, and the fact that it was so easily removed really says something. If you like this kind of glue, I would recommend E6000 over UHU though! There must be a reason why some people rave about it and it DOES sticks a littttttle bit better than UHU glue. I've been using resin glue for the longest time and honestly, I believed in it and was so sure that my pieces were stuck on well. CAN'T BELIEVE HOW WRONG I WAS?!?! How resin glue works is that you have two parts, A and B. One of them is basically the hardener, which dries the resin up. You put out equal amounts of it, and mix those two equal parts together. It works like epoxy resin, but they call this a glue so I'm assuming it's a bit better to use it as a glue haha. I use a toothpick to apply most glue, especially resin glue since I have to mix them anyway! It's just much more convenient and if I forgot about it and left it on the paper I can just throw it away, instead of cleaning my tools haha. Resin glue takes the LONGEST to dry out of the lot, and I honestly didn't mind especially if it was going to bond the pieces together well. 24 hours is the recommended waiting time, like normal epoxy resin! The resin glue was like a piece on its own though, unlike the UHU glue or E6000, which is still a little bit sticky and gooey. It also means that it's not that flexible, so if you're gluing it on pieces that needs to bend, this might not be a very good idea as the bending might make the glue come loose. The piece that was glued completely did a lot better though, as you can see! I couldn't take it out at all and I was really using a lot of strength! This GIF didn't show it breaking off but after I stopped recording I tried it again and it came off hahahahaha. I think it could be the brand of the resin glue too? This was a gift from @msparkpark so I can try it out, and I think it was bought from Daiso! Maybe the higher grade ones do a lot better. I might give resin glue another chance and one day buy a better quality kind, because it IS nice to be able to move things around before it dries completely! For resin glue though, you'd have to be careful because it does have a sort of tint to it, and if you're gluing white pieces together it might be reaaaally obvious! Seeing how the glue takes so much effort to prepare, and let dry, yet it's so easily break, I don't think I'll use them to stick my magnets (which I've been doing anymore) hahaha. Liquid clay can be used as a glue too! It's essentially polymer clay in liquid form, and so, it bonds quite well with polymer clay! It really depends on what kind of thing you stick it with though. I don't recommend gluing other stuff like earring backings with it because it's still polymer clay and you CAN break it if you want to/if it isn't baked properly. Being able to adjust it is important especially when you need the pieces to join seamlessly! Example if it's a piece that broke off etc. I put a bit too much liquid clay and it kinda went into the whole piece, so it was hard to find an opening haha. The liquid clay does bond well as you can see!! I use liquid clay whenever I put raw pieces together so it's nice to know that it works well hahahaha. 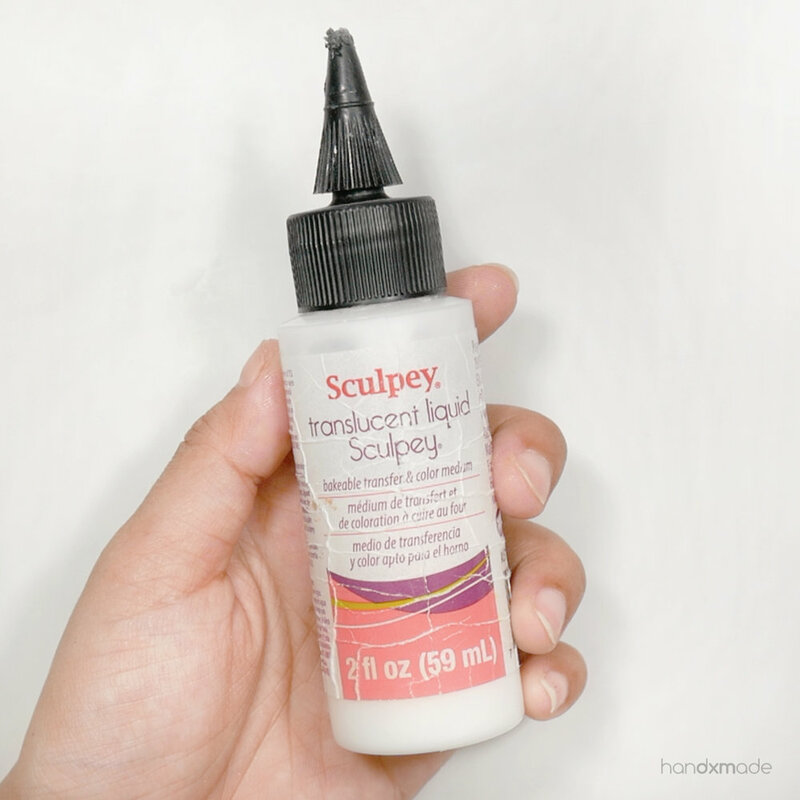 Sculpey liquid clay is white, but it turns translucent after baking! It IS more obvious after baking than FIMO though so do take note! Sculpey liquid clay is also a little bit thicker than FIMO, so it's a little bit easier to control it imo! I am assuming that since both are liquid clay, the results will be similar. Here's how the liquid clay bonds with the polymer clay! It really shows how it seeps into the clay. I think people give too little credit to superglue for polymer clay. IT WORKS LIKE A CHARM?!!? it does have quite a bit of cons like how superglue dries up so quick that you don't really have enough time to adjust the pieces at all, and how some brands leave a white residue after it's dry when you try to wipe it off. Look at how fast it dried up!! 😱😅 I couldn't even turn it and it got stuck like this HAHAHAHA. I'll definitely use liquid clay/resin glue if I need to fix polymer clay pieces and NOT superglue hahaa. This hurt me so much hahahaha IT BONDS VERY WELL. I was actually out of super glue that day, and was out to find more when I saw these Scotch superglues! There were this NO RUN GEL written on it and I was pretty amused by it. You mean it's superglue but it's not really liquid SO IT DOESN'T GO ALL OVER THE PLACE?? I HAD TO BUY IT TO TRY. Here's the liquid one, which is basically like all the other super glue, just glue and place it on! But look at how good it bonds with polymer clay! I was so happy when I saw this hahaha. Again this hurt me so I stopped hahaa. The glue does dry a but glossy, but there's no white residue so that's a good start! Now's the test for the no run gel. Is it really like superglue??? Will it stick as well?? As you can see, it's really like jelly and yep, no running at all hurhur. The no run gel does make it so much easier to control, and I didn't get a lot of it on my finger etc. Makes it easier to wipe the excess off, but it still does "stain" the clay and the glossy glue stain is still there when it dries! I did try to clean it off with my to-go nail polish remover, and it does go away. But not as much as I'd like. I'm sure I CAN make it go away altogether, but black polymer clay doesn't go that well with the remover hahaa. It works though, so that's all it matters! Just don't put SO MUCH GLUE like I did la hahhahaa.